In a HARDtalk interview broadcast on 28th July Stephen Sackur talks to Dr Haris Silajdzic, Bosnian President. The arrest of Radovan Karadzic was greeted with joy in the Bosnian capital, Sarajevo, where thousands died in a siege lasting three-and-a-half years during the civil war. The Bosnian president, Haris Silajdzic, welcomed the arrest saying it will bring greater co-operation in the region. But thirteen years after the war ended Stephen Sackur asks if the Bosnian Presidency is doing enough to take the country towards a multicultural future. Bosnian President Haris Silajdzic says the arrest of Bosnian Serb wartime leader Radovan Karadzic obscures a more important issue - that his "ethnic cleansing" project is still "thriving". 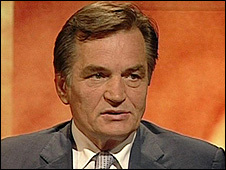 Talking to BBC television's Hardtalk programme, he criticised the Dayton peace deal which ended the 1990s war in Bosnia-Hercegovina. The following are excerpts from Stephen Sackur's interview with Mr Silajdzic, who was a Bosniak (Bosnian Muslim) leader in the war. We have seen in recent days the joy of people in Sarajevo, the tears of relief from the families of victims, of those murdered in Srebrenica. What are your feelings when you now reflect on the capture of Karadzic? I'm especially glad for the families of victims, because at least they have some satisfaction. But then I think the focus should not be on the criminal, but on the crime. Obviously Karadzic is arrested and his project is not arrested, it's free and thriving, living in Bosnia-Hercegovnia. [Former Yugoslav President Slobodan] Milosevic is dead, Karadzic is arrested, [former Bosnian Serb commander Ratko] Mladic will be arrested hopefully one day - and we have their project thriving. When people around the world hear that, I think they won't understand it. What do you mean, the project is "thriving"? Patently that isn't true, Bosnia is now in peace. Bosnia is in peace exactly because that project succeeded. Hundreds of thousands of - at least half a million - people are outside their own country because they have been ethnically cleansed, they're not there, because they were forced to get out under the threat of death. Our constitutional arrangement is such that actually it rewards the aggression and genocide and ethnic cleansing and so on. But hang on a moment, the situation in Bosnia today is reflective of the agreement which your own Bosnian leadership signed in 1995, the Dayton accords, that is the system under which Bosnia runs today, you signed it. Exactly. One technical correction - we are Bosniaks. True we are Muslims, but we have a national name, we are Bosniaks. Yes, it was signed, at gunpoint. It was signed, the question is whether it was implemented or not. I say it wasn't implemented. And I'll prove this to you. The crucial part is so-called Annex Seven of the agreement, about the return of refugees and so on in dignity. Now Karadzic, the same man captured now, said he could tolerate in that part of Bosnia - tolerate - up to 10% of non-Serbs, meaning that Bosniaks and Croats are out… Now the level of return today in that part of Bosnia is 8%. So we did not live even up to Karadzic's expectations. That's why I say the project is kicking and alive. I asked you for your reaction to Karadzic's capture, and you've already taken us right back to the detail of the Dayton accord and what you believe to be the failures of that accord. Many people say to you, Haris Silajdzic, it's time to move on, look forward, not back. Well, those who'd like to keep that arrangement are looking back. I'm looking toward citizens' representation in Bosnia, not ethnic representation - I think that's looking back. Are you saying that for you the political future for Bosnia has to rest upon eliminating the Republika Srpska, created under Dayton? That is, the autonomous Serb region inside Bosnia? But again the focus should be on the project. The criminal is caught and we leave the money on his account. That is not logical to me. A very different perspective and different emotions are heard on the streets of Pale [in Republika Srpska]... Serbs who live in Republika Srpska, many of them feel an unfairness about the process… they say there are Muslims too who are yet to be held to account, who also committed crimes in the terrible years from 1992 to 95. Would you acknowledge that? Oh, this is equalisation, which is wrong… They were defending themselves. It was a war against civilians, and civilians defended themselves. The crucial difference is what is your intent? The Bosniaks' intent was to defend themselves… In defending themselves they may have committed in some places some things I wouldn't like to hear or see..
My question is to you - if you sign a contract today and parts of it are ignored what do you do? ...You go back to the law. The EU is telling you to move on... You can change and modify Dayton, but not throw it into the trash can. The international community is in love with the status quo, but sometimes for the sake of stability and peace you have to actually do something, not follow the line of least resistance, and break some eggs to make this omelette.